Beds: 1 king, 2 twins, Sofa Bed, folding bed. 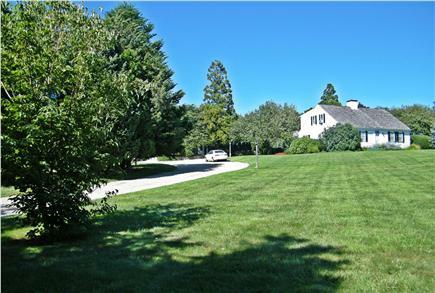 This two bedroom house is set on two acres of landscaped property on the Dennis/East Dennis line. 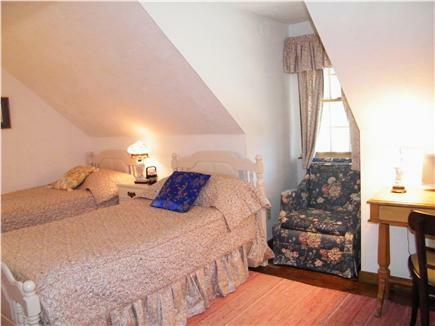 The master bedroom has a king sized bed. 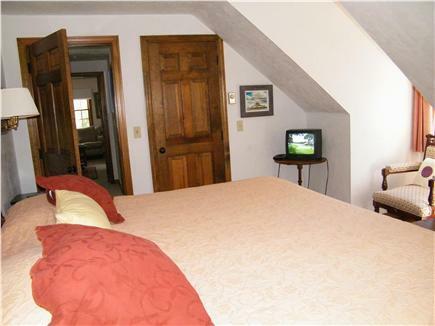 The large living room is nicely furnished, has a big flat screen TV and a pull-out sofa. All of those rooms are on the second floor. 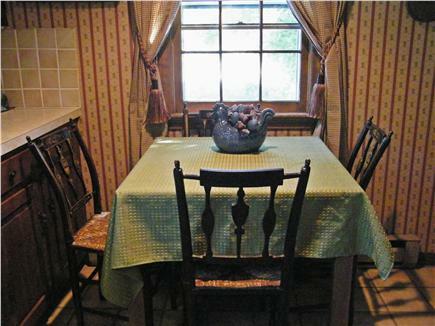 Downstairs is an eat-in kitchen and a second bathroom with a washer and dryer area. The house has central a/c and heat. 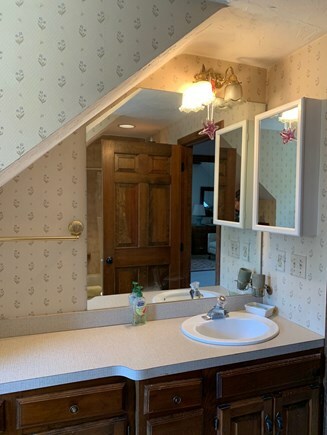 The kitchen is equipped with a full refrigerator, electric stove/oven, dishwasher, microwave, ice machine, coffee maker, flatware, dishes, utensils, etc., and a table for four. The house is at the end of a long driveway and is surrounded by trees. Although it is only a half mile to the beach or to Scargo Lake, you might have a hard time pulling yourself away from the pool which is 20 X 50 feet. 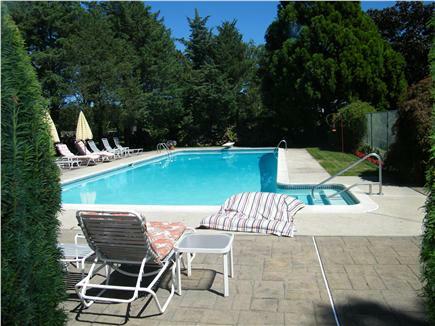 It is immaculate and has a diving board and hot tub. PLEASE NOTE: The pool is not covered and never gets really warm until the end of July. The hot-tub is just that it does not have jets. The large pool deck is complete with loungers, tables, chairs, umbrellas and a charcoal grill. 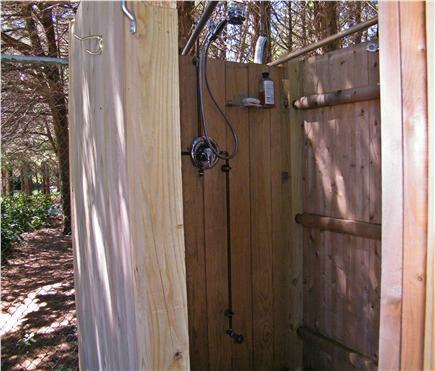 There is a fully enclosed outdoor shower with hot and cold water and lawn area along the side. 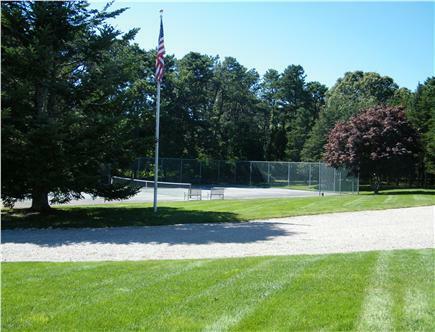 The tennis court is private and all yours during your stay. Smoking is strictly prohibited on this property: indoors and outdoors. As stated it is a half mile to Dr. Lord's Beach and to Scargo Lake (see the beach guide below). 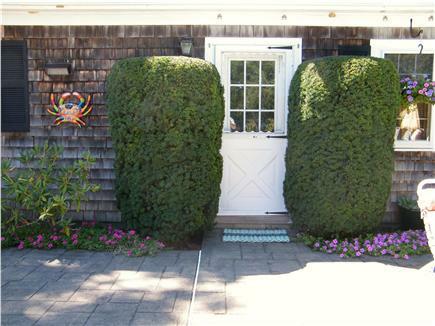 Eden, the only place where the authentic Cape Cod/Dennis Bracelets are made and sold, is a short walk from the end of the driveway. Corporation Beach. Harborview Beach, and Sesuit Harbor, Dennis Yacht Club, and the Marina Cafe are a mile away. Mayflower Beach is a little further. Please read ''About Dennis beaches'' below. Local restaurants, convenience store, bank, marina are all within one mile. The Lobster Roll sight seeing boat, para-sailing, jet ski rental, fishing charters and the Freedom Boat Club are all a mile away in Sesuit Harbor. Also close by are Eldred's Auction House, Scargo Pottery, and Dennis Village. 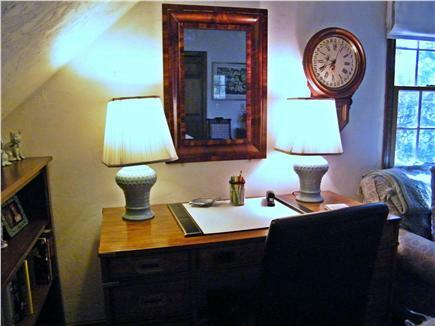 Many antiques shops, gift shops, bars, restaurants are all within a few miles at most. It is 1.30 miles to the Cape Playhouse, the Cape Cinema, and the Cape Cod Museum of Art. The Dennis Memorial Library, Dennis Congregational Church and the Green are just a bit further on 6A. At various times during the summer there are craft fairs, auctions, and band concerts on the Village Green. On the West side of Dennis are Dennis Public Market, Josiah Dennis Manse, Chapin Beach, Gina's by the Sea restaurant and Chapin's restaurant. There are too many shops and restaurants to mention all over Dennis and the surrounding towns. In neighboring Brewster is the Herring Run and the Stony Brook Grist Mill. Corporation Beach is a large beach with amenities such as a snack bar rinse tower, play area, and restrooms. It is very easy to get on and off (no dunes), and has lots of parking. Corporation is a great beach for families with children. Handicap accessible. There are life guards on duty here when the beach is open. 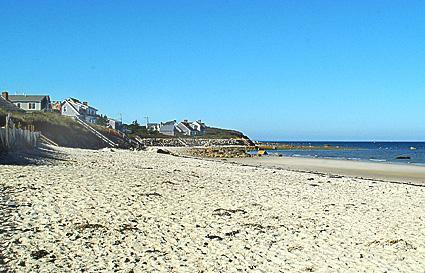 Mayflower Beach is a famous tourist beach. It mostly caters to teens, college kids, and younger day-trippers. It is very crowded and social. The Mayflower parking lot is often full by 9 A.M. in summer so bear that in mind should you plan to visit. Here there are restrooms, rinse towers, and a concession. It is handicap accessible. Howes Street Beach is next to Corporation Beach. There is one dune to go over but nothing at all difficult. This is a great all around beach with ample parking. Chapin Beach is on the western most side of Dennis and is famous for its flats and its 4 wheel drive trail. When it is low tide at Chapin you can walk way out but be careful to get back to shore before the tide turns. There are restrooms here. If you plan to use the trail your vehicle must have the appropriate permits from Town Hall. Dr. Lord's Beach is at the bottom of Dr. Lord's Road just beyond Eden. It can be accessed by foot only. It is a smaller, quiet beach. Do as the locals do and get dropped off here by someone who'll walk or bike back to join you. Scargo Beach is on the North (6A) side of Scargo Lake. It is fresh water with lifeguard and restrooms. Lifeguards on duty. Handicap accessible. Princess Beach is on the South side of Scargo Lake and has lifeguards, restrooms and picnic areas. Sea Street Beach is a nice big beach in East Dennis with restrooms. There are public beaches on Nantucket Sound on the South Side of the Cape as well as the magnificent beaches on the Atlantic in Wellfleet, Truro, and Provincetown. Here are spectacular dunes and exciting surf. There are other beaches in the area that require resident stickers. You may get to these beaches by foot or bicycle. Otherwise, stickers may be purchased from Town Hall upon your arrival. Additional availability info: Feel free to inquire about dates not listed as available and shorter stays. Additional pricing info: Cleaning and linen fees are included in the price. State and local taxes of 12.45% will apply. So beautiful, you'll forget to go to the beach!!! We had a friend's wedding at the Cape on Memorial Day weekend and we decided it would be best to stay for a few days. We were looking for a house with a heated pool and hot tub since it was off-season and we figured it we be too cool for the beach. During our search we landed on this house, and we couldn't have picked a better place for the price. 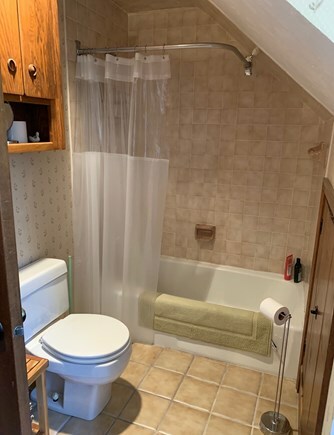 It was six of us and I was a bit worried about the house being on the small side with two bedrooms, but it was very spacious since it is on two floors. 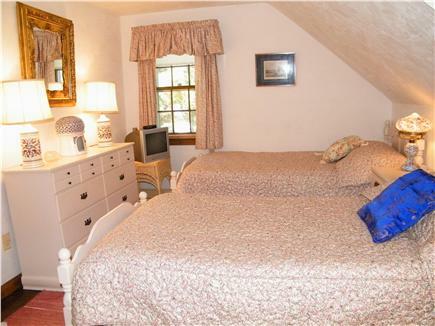 In addition to the bedrooms, they have a full size pull out couch and a twin size rollaway bed. They have fresh towels, soap, linens and most of the usual supplies with a full kitchen with utensils and also bottled water as a bonus. They also had a grill which was great and we used it for lunch. The house was very clean, well put together, and It was clear they had really prepared for our arrival. We are delighted that you enjoyed your stay! You were great renters who left everything in perfect shape. We hope that you will stay with us again. It was a pleasure to be your hosts. This property is wonderful. The pool is huge and we were here during a heat wave and used it a lot. The central air was a blessing too. The house was nice and cool! We don't play tennis but we asked the owners if our friends could use the court and they had no problem with that. It is very quiet and peaceful here. We barely ever saw the owners but any time we had a question they were available, charming and helpful. They are natives and know all about local restaurants, shops, beaches and shortcuts! 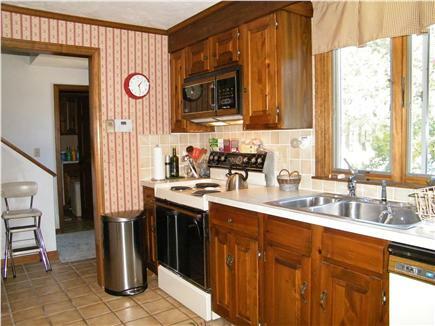 The house is immaculate and has every convenience. What a gorgeous place! The house feels very "homey" and comfortable. 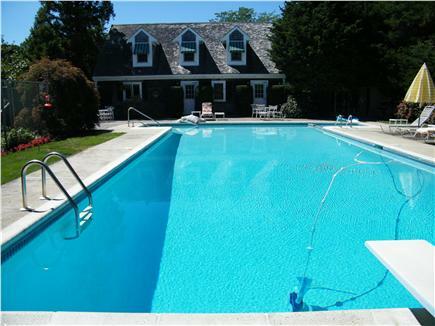 The pool, which is right outside the door, is HUGE. 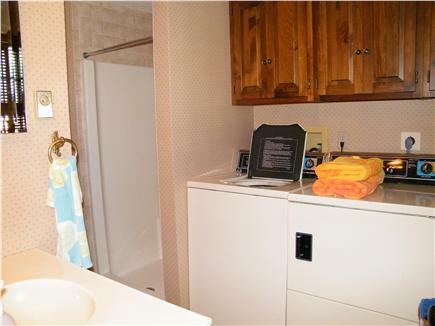 There's an outdoor shower and a tennis court. It's all so pretty! There are several restaurants, the Cape Playhouse and Cinema are fairly near and must see destinations in Dennis! Our hosts were gracious and responsive!